Meet Prince Yuki. He's smart, good-looking, pleasant, charming, dignified, and is most decidedly single (for most of the series). Absolute perfection - the epitome of bishounen. However, he'll reject your advances without a second thought and keeps his distance to the point of being standoffish. Want to know what's behind that cool exterior? Get in line. 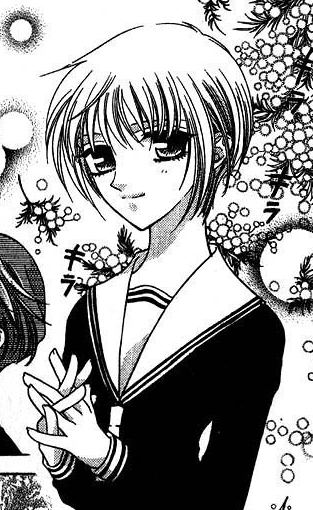 Part of the illustrious Sohma clan, Yuki comes from a large and, unfortunately, twisted family. Being cursed by the spirits of the Chinese Zodiac, Yuki carries the spirit of the Rat, so when he's hugged by anyone of the opposite gender or gets sick or endures a lot of stress, he transforms into a cute little mouse. As a child, he has poor health and apparently has asthma (or just weak "bronchial tubes"), which did get better as he aged. He enjoys gardening as a hobby. He's also pretty lazy, clumsy, and not very handy around the house - for instance, his cooking is abysmal and Shigure is all too happy to have Tohru do their cooking in his place. In the anime, Yuki is voiced by Aya Hisakawa, a personal favorite seiyuu of mine who also voiced Kero from Card Captor Sakura and Sailor Mercury/Ami Mizuno from Sailor Moon. You'll notice that Yuki is voiced by a woman - fitting, considering his girly appearance. Here is a short voice clip from the Fruits Basket audio drama, with a translation below. Basically, Kyo's voice has woken Yuki up from his post-sleeping stupor. Fruits Basket Audio Drama Yuki: Shut up, stupid cat! Don't make such a racket in one's ear. Stupid cat. Shigure: Did you wake up, Yuki-kun? Yuki: Once again I'm woken up by the stupid cat's stupid voice. Talk about the pits. His name in kanji, 草摩 由希 (Souma Yuki), has meaning mostly in his given name. The surname "Sohma" carries no particular meaning, but "由" (yu) means reason and "希" (ki) means hope - i.e. a "reason to hope," which is quite befitting of Yuki's life and his desire to move on from his painful past. "Yuki" is also homonymous with "雪", which means snow, and can apply to Yuki in his ice-prince(ss) status. However, snow in the winter melts in the spring, which parallels Yuki's growth throughout the series from a reserved and isolated person to someone who is much more open and engaging. I don't want to say too much about Yuki on this page - after all, this is meant to be a quick and dirty introduction addressing the basics, but I just wanted to give a feel for who Yuki is (not sure if I succeeded). Yuki's story is complex and his character can't be dissected in a page, so please continue to other sections of the site to learn more about his growth in Fruits Basket.